Deckers has been struggling with waning demand for its once-ubiquitous boot, and some users on StockTwits said the rally Friday was due to traders unwinding short positions. Deckers said it expects to report a loss of 12 cents per share in the current quarter. Chief Executive Angel Martinez said Deckers had a "very challenging year," but stressed that the company has gained "valuable insights." 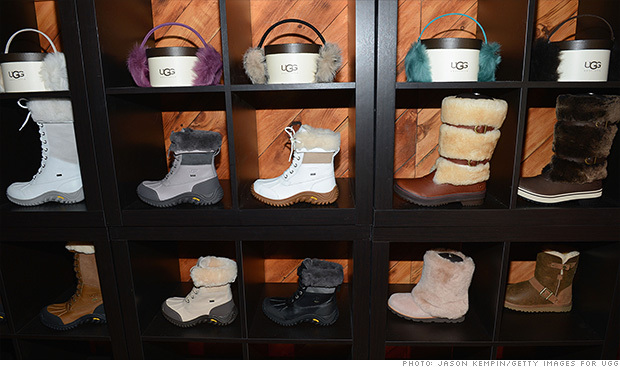 He said Deckers has taken steps to reduce its exposure to "sheepskin price fluctuations," and is working to expand the UGG brand to "broaden accessibility." when will $DECK be back on track? waiting for the sheep skin price to go down and let $DECK has high margin again. Deckers announced plans late last year to hire New England Patriots quarterback Tom Brady as spokes model for a new line of men's wear. This was clearly a strategic mistake, according to one StockTwits trader, who's probably not a Patriots fan. $DECK forecasting a loss next QTR. This is what happens when you hire Tom Brady as spokesman. Meanwhile, Deckers shares were also boosted by upbeat reports from analysts at Goldman Sachs (GS) and Jefferies. @smarterthanyou$DECK maintained neutral at $GS price target increased to $40... Still cautious but acknowledges potential turn around.